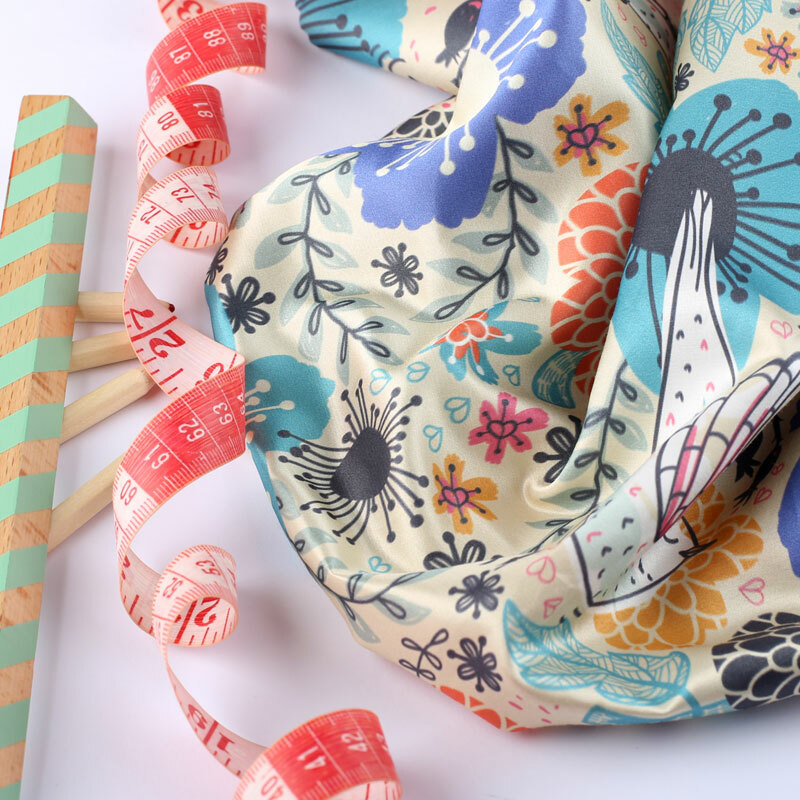 Can unusual fabrics make your craft projects even better? Ask someone to name a few fabrics, and the usual ones will spring to mind; cotton, jersey, silk, maybe wool, but delve a bit deeper and there is a whole world of unusual fabrics, you might not have known about. At Contrado, we are constantly adding to our ever expanding range of almost 100 customised fabrics. 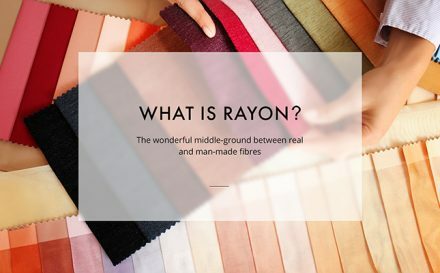 We strive to source fabrics, which have diverse and unique qualities and sustainable backgrounds and characteristics, which make them appealing for both the niche and mainstream markets. 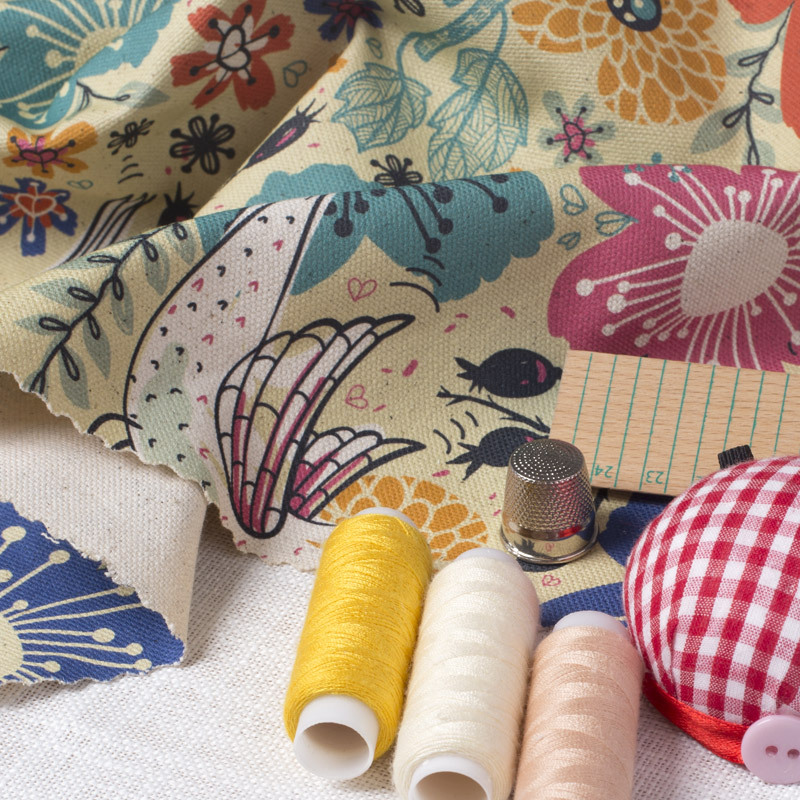 We love bringing you unexpected and quirky fabrics, which will make your collections and projects stand out from the crowd. We have seen customers work their magic by creating suits made from Neoprene, coats made from panama and furniture, upholstered in lace. When we see a demand for these unconventional fabrics from our customers, it gives us the power to go out there and source them. This is why we feel an obligation to educate about the importance of these fabrics and textiles. There are so many reasons to work with them and by showing an interest, we can continue to find more and more fabrics from sustainable sources, made from natural fibres, synthetic fibres and recycled material, which will make your crafting a talking point. We would love to introduce you to a few of our more surprising fabrics. And make sure you keep an eye on our fabric page at Contrado, as we are adding to our collection all the time. What is Cotton Silk Satin? Cotton is more than cotton when it is combined with silk, to create a truly luxurious and unusual fabric. This chic and lustrous fabric is naturally refined and combines the durability of cotton with the elegant and glistening qualities of silk. This remarkable blend of textiles makes this fabric one to watch! We love that it is a mix of 2 natural fibres; cotton and silk, and that both bring such unique qualities to the final textile. What are the main properties of the fabric? What can I use this fabric for? Linings for handbags and luggage. The gorgeous silk face will give the lining a luxe and high-end finish, while the cotton back will make it strong enough to withstand tears and rips from keys, pens and other handbag essentials. Pillow cases and bedding. Nothing feels better than sliding into a clean, soft bed, lined with cool silk. If you want the luxury of silk, with the strength of cotton, then this fabric is perfect. You also have the added bonus of it being easy to care for and clean. Cushions and soft furnishings. Decorate your home with bespoke, printed throw cushions. Thanks to its brilliant print qualities and colour reproduction, not to mention its luxurious finish, this fabric makes a brilliant choice for cushion covers. Fashion. Fashion designers love to use this stylish fabric to create their collections. The lustrous face showcases their designs beautifully, while the combination of cotton gives it a durability, which cannot be found in 100% silk fabrics. It feels silky, smooth, light and fresh, with a stunning drape, which makes it perfect for dresses, blouses and skirts. What is Organic Half Panama Cotton? Made from 100% certified organic cotton, this beautiful half-panama fabric is one of our favourite textiles. With a natural charm that can’t be replicated, this rustic fabric adds character to anything it is applied to. This remarkable fabric is unbleached and is lighter than the classic panama fabric, which all adds to its natural characteristics. If you are looking for a fabric, which has a vintage vibe and a workable nature, then we couldn’t recommend half panama enough. 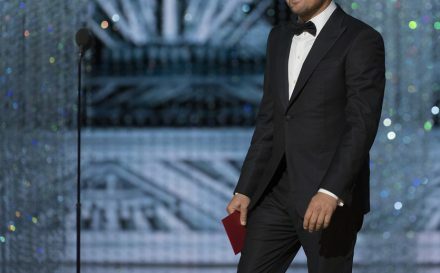 What are the properties of the fabric? Tote bags and other styles: This is a naturally hardy fabric, with no stretch. As such, it makes the perfect fabric to make a variety of handbags. Our favourite styles for the half-panama are tote bags and shoppers. These have long shoulder straps and a relaxed body, and look just stunning made from this natural fabric. Scatter cushions: If you are looking to add a homespun look to your living space, then try creating some cushion covers made from our half-panama. The unbleached, unprocessed 100% cotton will give your home that vintage vibe, that you are craving. Outerwear such as jackets: The retro look will always be on trend and it looks great on men and women of all ages. To help push your look a little further, try making a jacket out of our Organic Half-Panama Cotton. The muted tones, natural cotton flecks and rustic appearance all add to the wholesome and fashionable finish. Upholstery: Upholstery fabric comes in all styles and materials, from natural to synthetic. Thanks to its tight and solid basket weave, this half-panama is the perfect choice for homely, country-inspired upholstery fabric. What is Gaia Eco Woven? Perfect for the environmentally conscious, Gaia Eco Woven is a soft and durable fabric, made from 100% recycled materials. It has a crepe like texture and is simple in its construction, with a plain weave made from large yarns. This distinctive fabric has a lot of personality, which makes it a great choice for a whole range of usages. We can’t stop raving about Gaia. 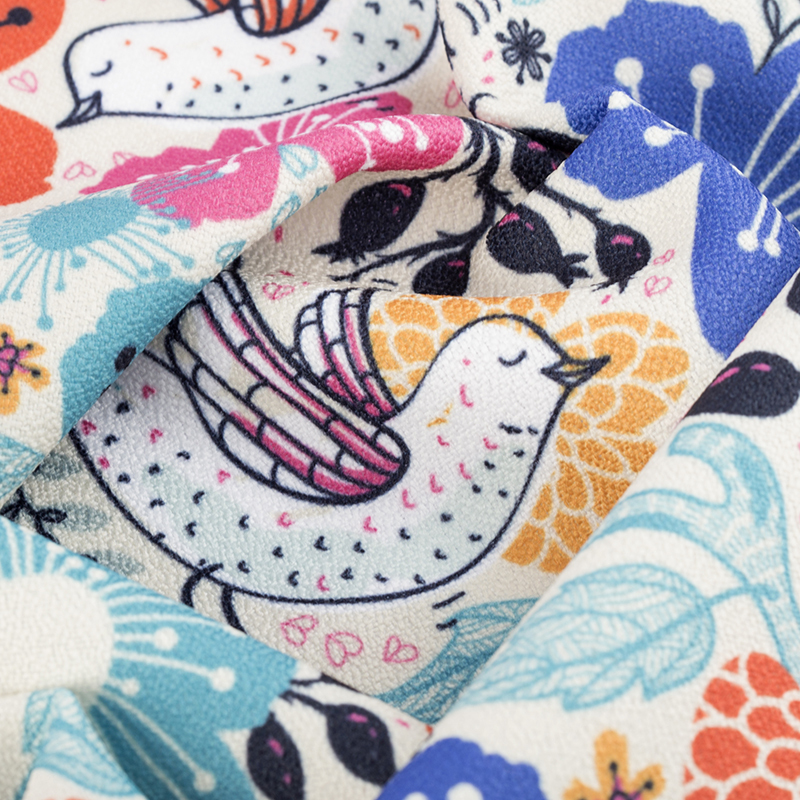 We just love how a 100% recycled fabric can be so soft, stylish and bursting with character. Soft furnishings: If you love making soft furnishings for your home, then try creating a cushion cover out of Gaia Eco. The notable qualities, such as its 100% recycled composition, the tight weave and the slightly coarse face, makes this an ideal fabric for cushion covers. Curtains: Forget boring curtain fabric, if you want to make your space stand out, make your drapes out of this quirky woven fabric. It is perfect for showing bold, punchy designs, so you can make your curtains a centre piece in your home. It is also almost 100% opaque, so it is great for blocking out sunlight. Banners and Flags: This durable fabric makes a great choice if you are looking to design banners or flags. Whether it is for signage for an event or a flag to fly in your garden or for a special occasion, this woven fabric will do the job very well. Neoprene is one of our most unique and unusual customised fabrics. It is a highly flexible and structured fabric, which has brilliant water absorbent and thermal insulating qualities. Once just used as a material for insulating and scuba suits, this versatile and quirky fabric is now making a big splash in the high fashion world. Our custom Neoprene prints like a dream and is thick and heavy with brilliant printing results. 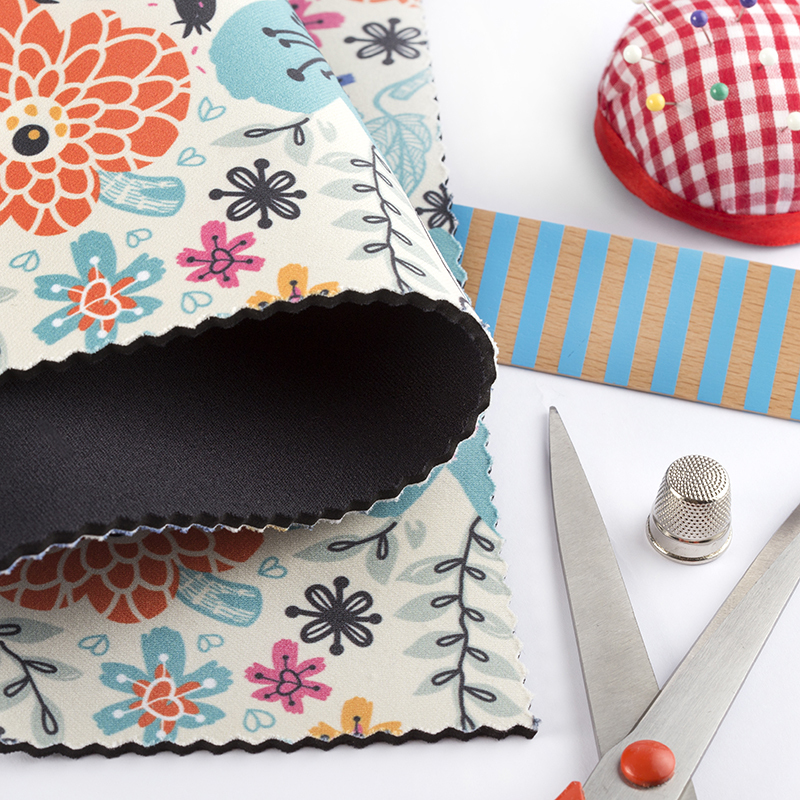 Gadget cases: Thanks to it’s spongy and malleable texture, Neoprene makes a great protective fabric. Try using it to make a unique gadget case for your phone, tablet or laptop. Mats: A lot of our customers have been using Neoprene to make mats for their various hobbies. We have seen some beautiful, customised yoga mats being made and also gaming mats. Because Neoprene is soft and supportive and springs back to shape, it makes it an obvious choice for these kinds of mats. Fashion and apparel: More and more, we are seeing Neoprene being used in the wacky world of high fashion. The highly structured body means you can create dynamic and dramatic shapes and silhouettes, which look amazing on the catwalk. Wine bottle coolers: Neoprene is a highly insulated fabric. Because of this, it is perfect to use as a sleeve for beverage containers, such as wine bottles. They will help keep bottles hot or cold. What is Princess Lace Satin? A luxurious and whimsical material, which combines 2 fabrics in 1. An elegant and matt jacquard lace is bonded onto a shimmering, satin back. 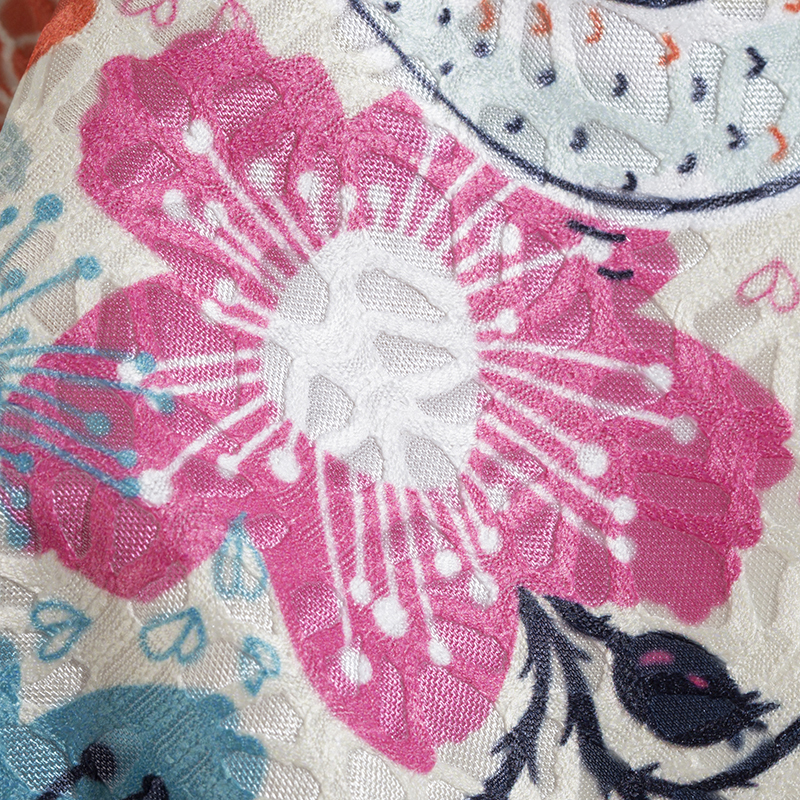 This eccentric and unusual combination makes this a lace with a difference! Thanks to its bonded back, it is also stronger than most laces – a real bonus when it comes to crafting with it. 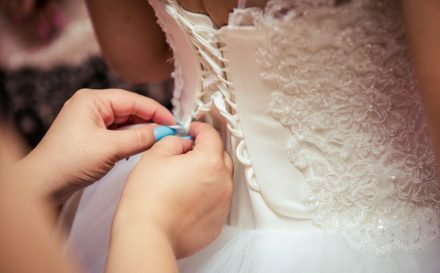 Wedding apparel: If you are choosing to make your own wedding dress, or you design wedding dresses, Princess Lace Satin makes a stunning choice for added detailing, edging, trimmings and trains. It adds the traditional lace look, with a contemporary spin. Bodies: We love seeing this lace fabric used for delicate bodices on dresses and gowns. The lustre of the satin adds a depth and luxe finish, while the brocade lace brings an allure of years gone by. Bolero jackets and apparel: As this is stronger than a lot of traditional laces, you can make more with it, especially when it comes to fashion. Bolero jackets and loose, summer blazers are a wonderful way to work with this unique lace material. Detailing and home furnishing: If you want to add a touch of whimsy to your home, try using Princess Lace Satin for things such as cushion covers, detailing and trimmings on furniture and even as a light upholstery fabric for very special furniture. 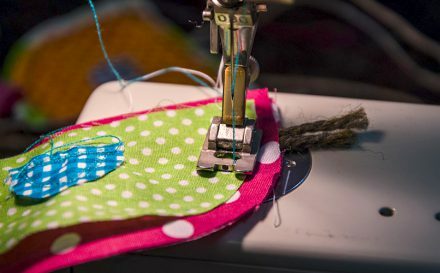 Why not try designing your own fabric? 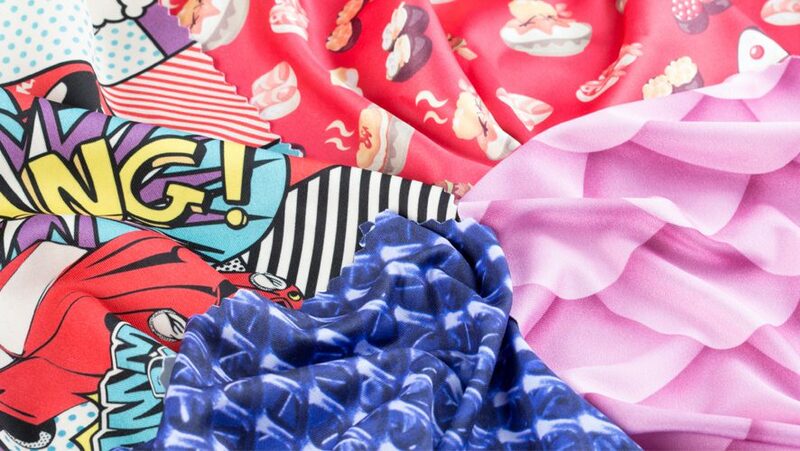 Explore over 100 fabrics in your own swatch pack.